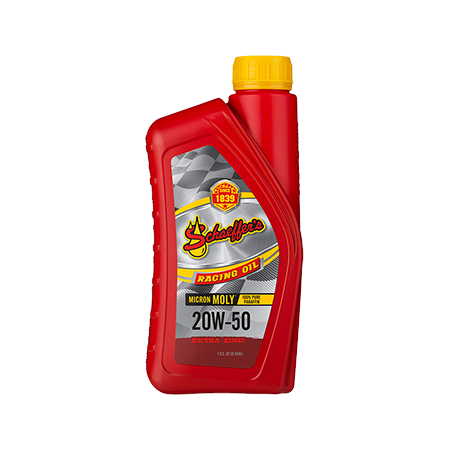 Micron Moly® Racing Oil is a high zinc, multi-grade engine oil designed for high performance gasoline engines including those that contain flat tappet cams and those that are turbocharged or supercharged. Micron Moly® Racing Oil is also designed for engines burning alcohol-based fuels. Micron Moly Racing Oil is engineered with the highest quality 100% paraffin base stocks and a highly advanced proprietary performance racing formula additive package. Using proprietary friction modifiers, Micron Moly® and Penetro®, our racing oil creates a slippery, tenacious shield to prevent metal-to-metal contact. As conditions intensify, this high performance racing oil resists thinning, and shields critical engine parts from heat and wear. By reducing friction and wear, Micron Moly® Racing Oil increases engine efficiency and extends engine life. With its high detergency and dispercency, our racing oil suppresses the formation of deposits, sludge and varnish and provides exceptional keep-clean performance. Excellent engine protection for hot running engines.